It allows to define default values to Scriptcase. Language - Define the language used in the Scriptcase GUI ( Error Messages, Control Messages, etc.). Security Resources - Enables you to disable the use of security in the development. 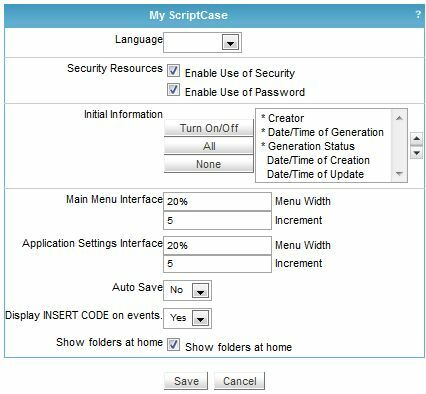 Initial Information - Select information displayed in the ScriptCase Main Menu. Pop-up Window - Enable pop-up window display for the selected resource. Main MenuInterface - Updates Applications Menu (the space between the Treeview menu and the applications display menu). Application Edition Interface - Update the Application width. Applications Creation - The options are the Wizard (Standard) and Express (Express Edition). Auto Save - Allows automatically saving changes in ScriptCase. Select the first menu item - Select the first menu item.